Ratepayer-funded energy efficiency programs need not be victims of their own success. For years, energy efficiency programs have been the engine behind the rapid adoption of more efficient light bulbs. And now that federal standards will force energy-intensive incandescent bulbs out of the marketplace, the administrators of these programs are wondering how their programs can maintain and even increase energy savings year in and year out. Rhode Island, one of the nation’s top performing states on energy efficiency, is showing other states what it means to plan ahead for this inevitable shift in energy efficiency programs. The lighting industry is in a period of rapid transformation. Around 2007, we saw the market shift from incandescent bulbs to efficient compact fluorescent lamps (CFLs). Around 2012, we saw a second transition from CFLs to the superior light-emitting diodes (LEDs). Energy efficiency program administrators have been instrumental in the spread of these new lighting technologies through incentives and outreach, and they have reaped the savings and associated benefits in the process. The success of efficient lightbulbs compelled the federal lighting standard to change, disallowing the production of less efficient bulbs as of 2020. Overall, the new lighting standard is a huge win for energy efficiency. Consumers will only be able to purchase the most cost-effective lighting technology available. The new standard will also drive costs down and increase savings further as manufacturers work to distinguish themselves and their product in a highly competitive market. The problem for program administrators lies in what they can claim as savings. Residential lighting savings can represent a substantial percent of the annual savings across energy efficiency programs. As a result, program administrators will likely see a large portion of today’s claimable savings disappear. 1. The Residential Lighting program, the core program affected by the lighting market transformation, represents a substantial portion of 2017 Residential annual savings. 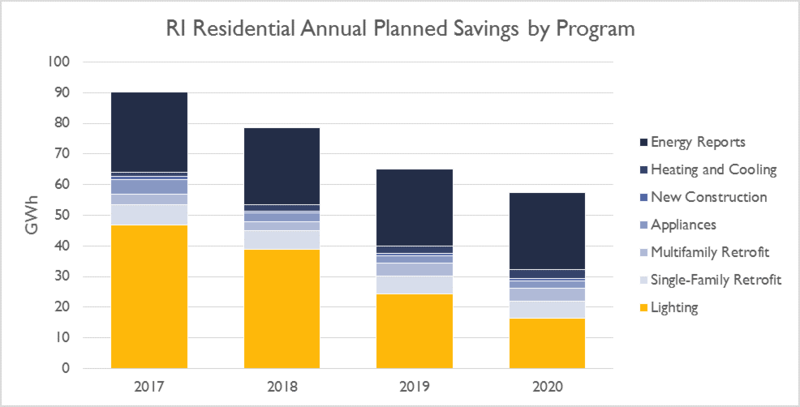 The Lighting program shown in the graph below in yellow is projected to contribute 52 percent of the annual savings for all Rhode Island Residential energy efficiency programs in 2017. 2. Approximately 65 percent of the projected 2017 Residential lighting savings will not be claimable by National Grid by 2020. All sectors, through: (a) strategic electrification and a shift in investments to reduce the use of carbon intensive fuels in line with recently adopted state energy policy; and (b) investments in pilots and demonstrations such as connected devices for demand response, energy storage, zero energy homes, and lighting controls for occupancy, vacancy, and dimming. 4. The surprising speed of the Residential lighting market transformation led to an inclusion of an innovation adder in 2019. The innovation adder is a placeholder for new program offerings that will be identified over the course of the next year by a potential study. The 2019 Energy Efficiency and System Reliability Plan will provide additional detail on these opportunities. The full impact of the new lighting standard on energy efficiency savings remains uncertain, but it has undoubtedly sparked a new wave of innovation. Regulatory standards that drive our country to reduce energy consumption should be considered a step in the right direction, regardless of the challenges they create. As other states look to the future of their energy efficiency programs, they should follow Rhode Island’s lead by continuing to innovate and look for new opportunities to save energy. Stay tuned for more on energy efficiency innovation in our December Energy Efficiency Series Blog. In 2014, Rhode Island passed the Resilient Rhode Island Act, calling for an inventory of greenhouse gas emissions by sector and major source and the development of strategies and implementation measures to achieve emissions reduction targets of 10 percent below 1990 levels by 2025, 45 percent below 1990 levels by 2035, and 80 percent below 1990 levels by 2050.